interested in this YDCC Bank vacancies they can submit application form online on or before 01-04-2019 through the Yavatmal DCCB official website of yavatmaldccbank.co.in. 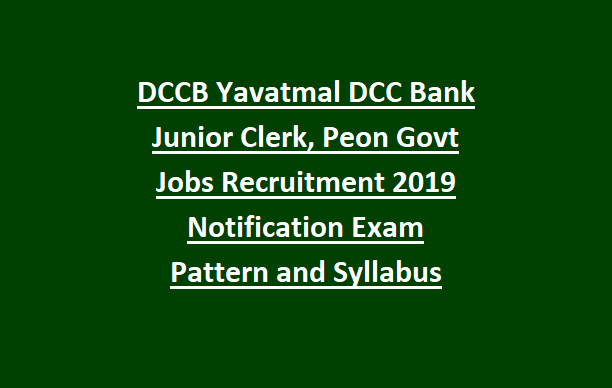 There are total 147 Jr Clerk and Peon vacancies are in this Yavatmal DCCB Bank recruitment 2019. Exam pattern, Syllabus, qualifications, important dates, online application process and other details of YDCC Bank Clerk recruitment is updated below. Download notification for Yavatmal DCC Bank Recruitment. There are total 147 vacancies available in Yavatmal DCCB Bank recruitment 2019. For Junior Peon Jobs-10th pass. Age limits are 18-35 years for all the posts. For SC/ST category 18-40 years and for OBC candidates 18-38 years. Selection for this Yavatmal DCC Bank will be based on written test and Interview for this Jr Clerk, peon Jobs. Online Exam will be conducted for 90 marks and personal interview for 25 marks. Paper difficulty level will be different for each post. Submit application form online @Yavatmaldccbank.co.in on or before 01-04-2019. It is mandatory to provide currently using mobile number and email id at the time of online form submission. 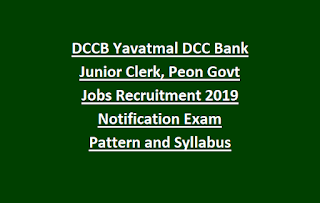 Click here to apply online for the Yavatmal DCCB Junior Clerk/Peons Jobs Recruitment 2019. Please share this yavatmal DCCB Junior Clerks and Junior Peons Recruitment 2019 article with your beloved friends through social networking sites.